These show notes may contain affiliate links. When you click through and make a purchase, SewHere receives a commission at no cost to you. Today’s podcast is a question and answer session! We asked for topic suggestions and questions in The Self Sewn Wardrobe group a while back, and we were not disappointed. Sometimes, we have to remember that everyone is at a different place in their sewing journey, and maybe they weren’t around when we’ve answered questions before- so getting topic suggestions from you all is so important! Let’s discuss why you’d tear a woven fabric and when it might be useful. When you tear a woven fabric, you are finding the true grain of the fabric, because if it does tear, it tears along one thread. You’ll also find that your fabric might not be on grain. Fabric gets contorted when it’s been on the bolt or it’s been stored improperly. Bolts that are stored upright on their ends can easily get out of shape. Colette’s experience seems to be that fabric stores used to tear her woven fabrics, and now they don’t. When Zede managed a fine fabric store, we would tear when we could. The alternate method to find the grain is to clip the selvage and pull a thread to find the grain. Some wovens won’t tear. Twills, unevenly woven fabrics, or fabrics made from very strong fibers. So, tearing is not always an option in the first place. If you know that your fabric is on grain in the first place, making a straight cut after you have a good start will ensure that your cuts are on grain. Why did fabric stores stop? Maybe they don’t want you to know it’s off grain! Ha! Another motivation behind Colette’s question is probably that she’s received cuts of fabric that are terribly off-grain. Us too! We think that the employees in most fabric stores nowadays are not trained sufficiently to know when to tear fabrics, what will tear well, or even how to identify the grain of the fabric. It can be a time consuming practice, and most stitchers would probably be happy to accommodate the time- but company’s aren’t interested in compensating people for the time it takes to do this. Tearing can freak customers out too! The sound can be unnerving. Also, certain fabrics that can tear, shouldn’t be torn. Tearing can sometimes distort the edge of the fabric. If you’ve ever torn a polyester satin, it can almost looked melted on the ends. Another useful tip is that you can tear fabric to find the grain, but do not tear pattern pieces. If you need a bunch of 4″ strips, don’t clip into the selvage every 4″ and then expect the strips to be the perfect width. Torn edges can be wavy, and have stray threads poking out. Tear to find the straight of grain on your fabric, but then cut your pattern pieces with your rotary cutter or scissors- even if they are a bunch of pieces with straight edges. Sometimes fabric can appear off-grain, but they’re actually just distorted, you can wet it down and reblock the fabric into shape. Sort of like a knitter blocks a shawl. You’ll need to identify the grain first. A couple people in the group beat us to the punch by saying that there’s no wrong way to learn! We’ve seen bad instructions from Indie patterns and the “Big Four”. The issue of whether or not you sew a sleeve in before seeming up the bodice is a fun question to explore. There might be a reason to do it one way or another- and both can be right! Say you’re sewing for show choir and making 42 knit tops, and you know you might have alterations to make. We’d sew the seam in flat, because we know we might zip right up the side seam and down the sleeve to alter the shirt. The more skilled and practiced you become, the less this distinction will matter. The problem with setting in a sleeve flat is that sometimes people can over-distort the sleeve. But, that might not be a problem for you. The reason the process of setting in a sleeve originates from the set in sleeves on woven garments. This subtlety isn’t necessary in the world of knits. An aside- apparently there’s a big controversy about knit sleeves being symmetrical and a group of stitchers out there that think this is anathema…or something. Knit sleeves can be symmetrical, because there’s more flexibility in the fabric that in a woven. Of course, you can make an asymmetrical sleeve if it suits your needs better! Another topic that came up in the group was overstitch hemming. A member said that they always hem before seaming together their garment. We don’t do it this way. Upon further exploration, the member said that some angles are too acute to handle with their coverstitch machine. Aha! We always make sure that our shirt tale hems have enough of a curve at the side seam to make it more comfortable for coverstitching! So, it wasn’t that one way was wrong or right, but that we were accommodating the process that we wanted to use. It was a productive exchange! We don’t think Ann should be automatically wary of Indie patterns just for the sake of the brand. You’ll decide what works for you and what doesn’t- and you can find comfort and discomfort in any pattern! One time, Mallory used an Indie pattern to make trousers, but used the instructions for a fly front from another indie pattern, because they made more sense to her. Of course, sometimes inexperienced designers create patterns. Zede’s pet peeve is words like “up” or “down” that can be confusing or even subjective. And sometimes major pattern brands mislabel pattern pieces or mess up grading- it can happen! Zede reminds us that it’s important to know the rules before you break them, and you’ll start to anticipate when you want to make accommodations for yourself- like the angle of your shirt tale hem! We always end up modifying the process of constructing a garment. It’s so important to soldier on and keep sewing, making, and experimenting. I think sometimes people want to make sewing rules where hard and fast rules don’t belong. It’s great to question why people make certain claims, and we try to justify our reasons for why we construct things the way we do. (cough, cough 3TN). Group member and guest blogger Fred actually made our RhapsoTee with an asymmetrical sleeve. That’s not the way we instructed the drafting guide to be interpreted- but it worked for her- so great! Keep in mind that everyone you follow or see on the internet might be using equipment or materials that are different from what you have! This really keeps things interesting when you’re trying to sort out the best way to do something. We’d be wary someone who makes absolute claims with no explanation. All you have to do is politely ask why someone does things the way they do, and hopefully they’ll answer in a way that helps you to know if it’s a good solution for you or not. 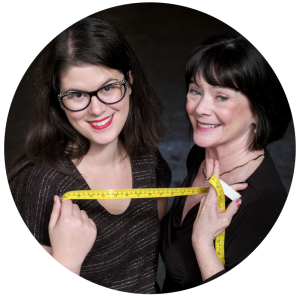 One “absolute” we often trot out is to never try on garments inside out for fitting purposes. We justify it by saying that you won’t get an accurate fit, because the garment is turned around, and things fit differently when they’re right side out vs. inside out- I think those are pretty good justifications. You might sometimes look at a pattern and question the method. Maybe give it a try and see if you’re missing anything. If not, go back to your old ways. If it’s helpful, adopt a new technique. It’s not always necessary to make a value judgement. Mallory talked about how she swapped out the lapped zipper for a lapped zipper on the Jenny Trousers- it was just a different choice- not right or wrong. You may also find that certain parts of a garment or certain techniques become second nature- like waistbands or zippers. So, Anne, keep growing, trusting your instincts, and asking questions! 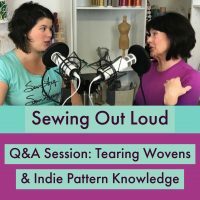 We think that since you’re asking these questions, you’re on the right track to be a thoughtful, successful stitcher. Turn the WiFi off! : If you use Audacity to record your podcast, turn off your WiFi when recording. If you don’t, you might end up with terribly corrupted files- ask us how we know!